This treatment is a strong painkiller, belonging to the opioid category of analgesics. It is designated for cases of moderate to severe pain. This might be post-operative discomfort, or pain related to an injury or chronic condition.This medicine is most commonly used in situations where paracetamol or other mild forms of pain relief have not succeeded (or are not likely to). 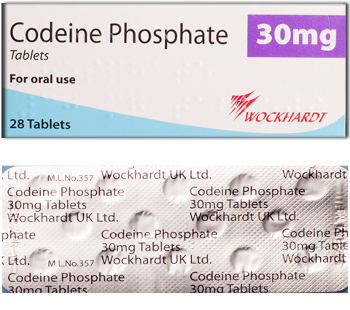 Codeine has also been issued to treat severe coughs and diarrhea. The acting ingredient in this pain treatment is codeine phosphate. It works by releasing chemicals in the brain that mimic the action of endorphins. Once active, these chemicals help to dull the brain’s perception of pain signals by combining with opioid receptors (hence the name, opioid analgesic). Although it is effective in reducing pain, it will not remedy the condition or injury causing discomfort. As it is stronger than many other forms of pain relief, you will always need prior consultation with a doctor in order to buy Codeine online from a UK pharmacist. This is to ensure that the medication is safe for you to take, and that you are not at increased risk of suffering from severe side effects. Known possible side effects include blood problems, nausea, vomiting and addiction. A doctor may not issue this treatment to persons who are pregnant, breastfeeding, allergic to any ingredients, or who have a history of liver or kidney disease. Those who have been alcohol- or drug-dependent in the past may also be unsuitable. The information provided here is not extensive. For a full list of restrictions and possible side effects, consult the safety information leaflet. The UK-based pharmacy which handles our orders will always ship your order via next day courier. If approved before 3pm on a weekday, your order should be with you by the following working day. At all other times, your order will be delivered at the next earliest opportunity. We will always put your safety and privacy first. All of our orders are sent using sealed, plain packaging. When you buy painkillers online, it is vital to purchase from a site which is safe and legal. After placing your order with Pain Relievers UK, your case will be reviewed by one of our GMC-registered doctors. If approved, an electronic prescription will be issued to you, and sent directly to our dispensing pharmacy.